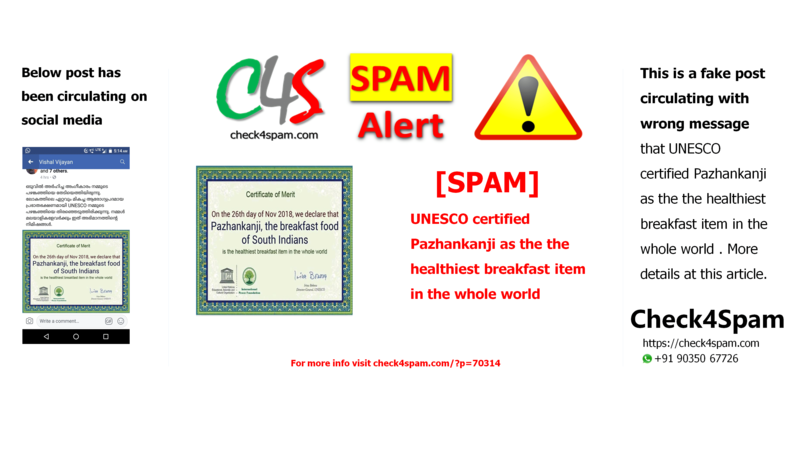 This post claiming that UNESCO certified Pazhankanji as the the healthiest breakfast item in the whole world, circulating on social media is fake. Please find more details at the verification section of this article. Health is very important. We all know it very well. We must have healthy, hygienic, well cooked nutritious food. It keeps our body and mind healthy. But when it comes to our brain, shall we not keep that too clean and healthy. Unfortunately we ignore this aspect often. Definitely we should eat healthy breakfast. May be Idli, Dosa, Upma, Paratha or Pazhankanji. We believe in what is shown to us without finding facts about it. Now let’s look at the certificate. Look at the signature and let’s first check out who is the UNESCO (United Nations Educational, Scientific and Cultural Organization) DIRECTOR GENERAL in the year 2018. The name written on certificate is Irina Bekova who was the former UNESCO Director General. At present the Director General of UNESCO is Audrey Azoulay She was appointed ad DG UNESCO on 10th November 2017. So now we can clearly believe that this is a fake post. Below is the picture of Present UNESCO Director General Audrey Azoulay. “We used to ignore such emails and Whats App messages as harmless rumor-mongering but it is really getting out of hand now. Respectable publications and people have started sharing these ‘declarations now’ damaging UNESCO’s name. What will people think, we spend our whole day listening to national anthems, reading religious books and observing how PMs around the world walk and talk? We are doing something good here, trying to make the world a better place. Actually trying to make the world a better place, not like the beauty queens at Ms Universe pageant”, said an exasperated UNESCO official. “This is the last declaration from us that is not related to our work so can people please just stop sharing that Whats App message? You get absolutely no points or money for circulating these messages so just don’t. Just circulate cat pics and dog videos like normal people”, the official added. Read more. UNESCO has not done any such announcement. There has been many such fake UNESCO certificates rolling around social media with false statements. Please find such kind of more fake ones below. Eat healthy be healthy. Know the facts, share the facts and keep the minds healthy.